According to local legend, the now renowned original icon was accidentally discovered by a hunter in pursuit of his prey. Upon discovery, the icon of the Virgin Mary was called Virgin Mary of Napa, eventually shortened and now known as Ayia Napa. The present monastery, built in 1100, was built around the cave, in honour of the Virgin Mary of Ayia Napa. According to local tradition, until 1790 no one lived within close vicinity of Ayia Napa. The first inhabitants were from Salonica, Greece. The name of the first inhabitant of Ayia Napa was Nikolaos Kemitzis from thesalloniki. he arrived from Greece around 1790 and got married to a village located on the northern east part of Ayia Napa and paralimni, the name of the village was panayia. soon after the marriage kemitzis had a fight with the ottoman authorities which ruled Cyprus at the time. and decided to move near the monastery of ayia napa. 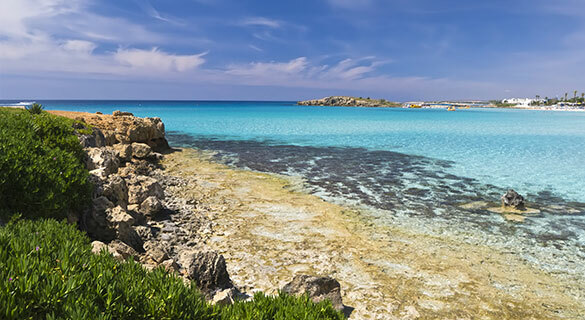 Geographically, Ayia Napa lies near Cape Greco at the eastern part of Cyprus, just south of Famagusta and forms part of a larger area known as Kokkinochoria (“Red Villages”, a name derived from the red colour of their soil). It is a town of Famagusta District, in the remaining southern part of the district occupied by Turkish forces in 1974. Ayia Napa is about 8 kilometres (5.0 mi) from Protaras, a town that has recently seen similar development, but still manages to remain low-key and remains more favourable for families and Cypriot locals.